Envirosafe Ireland supply Protex Developments’ Large Scale Storage and Retrieval Workstation. This workstation provides a lab-side storage and feeder facility from 1000mm to 2500mm wide. 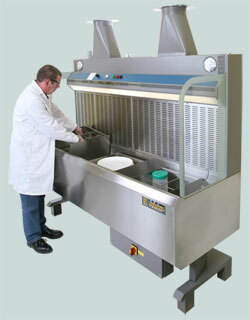 Designed to provide a local retrieval station for decanted size preparations. The workstation protection threshold and dull container depth sump significantly reduces transfer hazard from a central store to the lab user. The pump can be arranged to accept most containers. The workstation has user protection of 0.1ppm (gas containment threshold).